The Family Panel are excitedly awaiting the start of the World Cup, and as such have been searching hard for the best prices on England Kit for the Tot Testers as its their first world cup. So, where can you get the best price online? We looked at Market Leaders online stores as well as lesser known companies, and there are bargains to be had if you get in early. The kits will be selling during March, so its the best time to invest early. First up is JJB, a well known High Street brand. They"re selling the Baby kits, which include a shirt, socks and shorts for 24.99, and Infants again with shirt, socks and shorts for 29.99. The most expensive online price was from UK Soccer Shop an online retailer, who are charging for all sizes in Kids kit and only sell the Long Sleeved top with no socks or shorts for a massive 44.99! 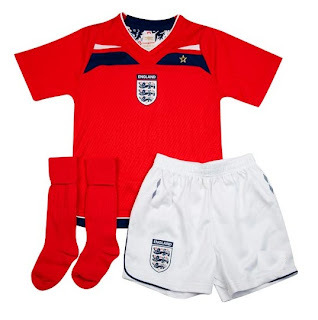 England and The FA's very own official shop, JD Sports and Kitbag.com all sell the Baby Kit for 29.99 and Infant kit for 34.99, but these do include the socks and shorts. Very, an online catalogue store who has Fearne Cotton and Holly Willoughby as two of us designers currently have a special pre-order price , with the Baby kits priced at 30.00 and the Infants at 35.00, but these will go up after March, so get in quick. Empire, another catalogue retailer online, matched the Infant kit price of 35.00, and theirs is not a limited offer price, so if you miss out on Verys, might be worth bookmarking them. However the cheapest online price we have found, is Sports Direct. Get ready to click that link and order now, as at 22.00 for a baby kit, and 25.00 for a Infant kit, and yes that includes socks and shorts as well as the shirt we're sure these will sell out quick! So, for the best price head to Sports Direct, and the one to avoid is Uk Soccer Shop. We'll update this as soon as any new prices, or discounts, crop up!